Rabbi in Casale in the seventeenth and eighteenth centuries. He was on terms of intimate friendship with Judah Finzi of Mantua and with Benjamin Kohn of Reggio, and was a pupil of Judah Briel. A responsum of his, treating of the defilement of the tent ("Ṭum'at Ohel"), is reprinted in Lampronti's " Paḥad Yiẓḥaḳ," p. 72; and another is included in Corinaldi's "Dibre Shalom we-Emet." He was the author also of a poem expressing grief over the ravages of a pestilence, in which the words of Middot are introduced in such a manner as to form the opening and closing phrases of each of the four cantos. According to Zunz ("Literaturgesch." p. 448), he was a descendant of the Judah ben Abraham who in 1627 was leader of the Jewish community at Chieri. Abraham is mentioned in Raphael Meldola's "Mayim Rabbim" (ii. 8), in Samson Morpurgo's "Shemesh Ẓedaḳah" (iii. 13), and in "Milḥamah la-Adonai" (p. 17, Amsterdam, 1714). Scholar of the eighteenth century; born at Turin; died at Safed 1772. He went to the latter city at the age of twenty-five, and there pursued his Talmudical studies together with the Polish scholar Israel Ashkenazi. He wrote commentaries on the Mishnah and on Maimonides' "Yad ha-Ḥazaḳah"; also a collection of responsa and sermons, published under the title "Ḥibburim." He is said to have had a family of ten sons and two daughters. At a ripe age he undertook travels abroad in order to collect alms. For a time he sojourned in Jerusalem. Dayyan at Alexandria, where he died in 1641. Rabbi of Parma in the beginning of the nineteenth century. Scholar of Vercelli; flourished in the eighteenth and nineteenth centuries. He was the father of Joshua Benzion Segre, who was a member of the Paris consistory from 1805 to 1809. Lived in Vercelli in the seventeenth and eighteenth centuries. He was the father of Joshua Benzion Segre, rabbi of Vercelli. Scholar of Padua; flourished in the seventeenth and eighteenth centuries. He was the grandfather of Benjamin ben Judah Segre, and was one of the three Italian delegates who in 1746 were sent to the Levant in order to inquire into the origin and purpose of the Shabbethaian movement. He himself was a follower of Shabbethai Ẓebi. Ḥayyim was the author of "Binyan Ab," in which he treated especially of R. Abbahu's rules regarding the blowing of the shofar at the New-Year festival. Ḥayyim was the father of Elisha Segre, rabbi of Vercelli. Scholar of Vercelli, where he died in 1854. Rabbi of Casale Monferrato in the seventeenth century. According to Zunz's "S. P." p. 362, he died in 1619; but according to the same author's "Literaturgesch." p. 425, in 1629. An eminent liturgical poet, he was the author of: a hymn to the New Moon, in five stanzas, which is signed "Ya'aḳob Segre," and is reprinted in Mordecai Jare's "Ayyelet ha-Shaḥar"; a long prayer in prose, beginning with the words "U-beken ribbono shel 'Olam"; a seliḥah (in prose) on the siege of Casale in 1629, beginning with five stanzas; a poetical approbation of "Ḥesheḳ Shelomoh," which appeared in 1588; an approbation of Isaac Alatrino's commentary on the Song of Solomon (1605). Jacob was on friendly terms with Mordecai Meisel of Prague, and wrote a poem on the occasion of the founding of the Meisel Synagogue (Purim, 1590). 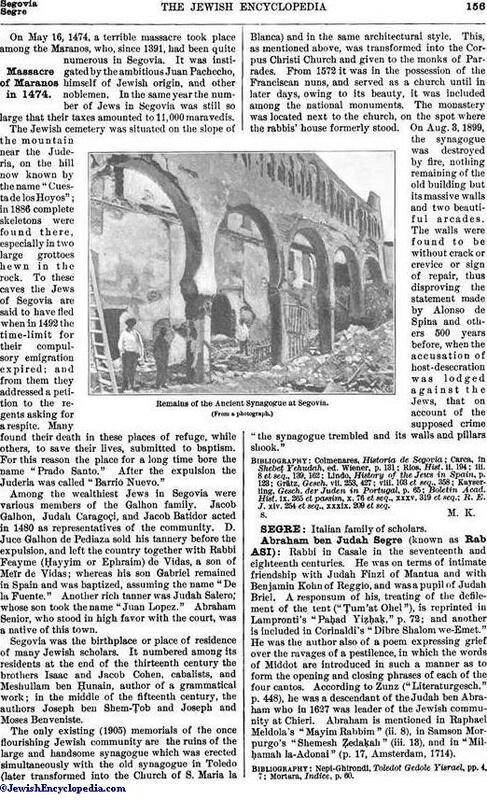 Another of his poems has been inscribed on a tablet in that synagogue. Kaufmann, in R. E. J. xxi. 143-145. Rabbi of Treves in the eighteenth century. He was related to S. D. Luzzatto, and was a colleague of Raphael Nathan Tedesco Vitale. 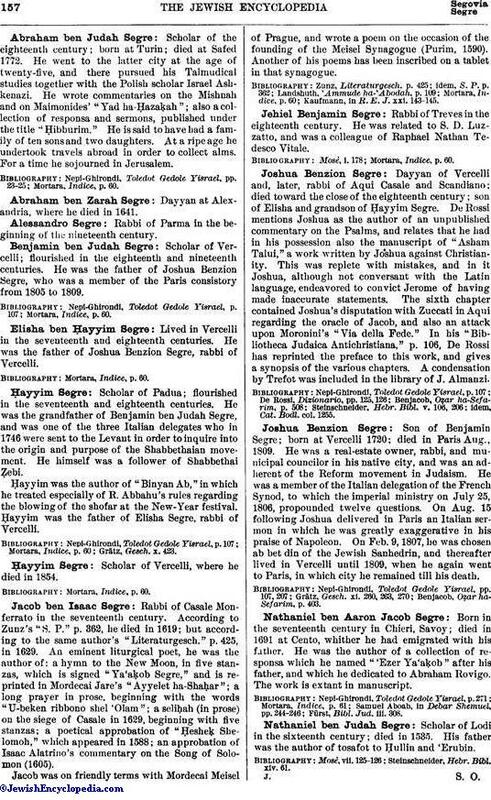 Dayyan of Vercelli and, later, rabbi of Aqui Casale and Scandiano; died toward the close of the eighteenth century; son of Elisha and grandson of Ḥayyim Segre. De Rossi mentions Joshua as the author of an unpublished commentary on the Psalms, and relates that he had in his possession also the manuscript of "Asham Talui," a work written by Joshua against Christianity. This was replete with mistakes, and in it Joshua, although not conversant with the Latin language, endeavored to convict Jerome of having made inaccurate statements. The sixth chapter contained Joshua's disputation with Zuccati in Aqui regarding the oracle of Jacob, and also an attack upon Moronini's "Via della Fede." In his "Bibliotheca Judaica Antichristiana," p. 106, De Rossi has reprinted the preface to this work, and gives a synopsis of the various chapters. A condensation by Trefot was included in the library of J. Almanzi. idem, Cat. Bodl. col. 1255. Son of Benjamin Segre; born at Vercelli 1720; died in Paris Aug., 1809. He was a real-estate owner, rabbi, and municipal councilor in his native city, and was an adherent of the Reform movement in Judaism. He was a member of the Italian delegation of the French Synod, to which the imperial ministry on July 25, 1806, propounded twelve questions. On Aug. 15 following Joshua delivered in Paris an Italian sermon in which he was greatly exaggerative in his praise of Napoleon. On Feb. 9, 1807, he was chosen ab bet din of the Jewish Sanhedrin, and thereafter lived in Vercelli until 1809, when he again went to Paris, in which city he remained till his death. Benjacob, Oẓar ha-Sefarim, p. 403. Born in the seventeenth century in Chieri, Savoy; died in 1691 at Cento, whither he had emigrated with his father. He was the author of a collection of responsa which he named "'Ezer Ya'aḳob" after his father, and which he dedicated to Abraham Rovigo. The work is extant in manuscript. Fürst, Bibl. Jud. iii. 308. Scholar of Lodi in the sixteenth century; died in 1535. His father was the author of tosafot to Hullin and 'Erubin. Steinschneider, Ḣebr. Bibl. xiv. 61.